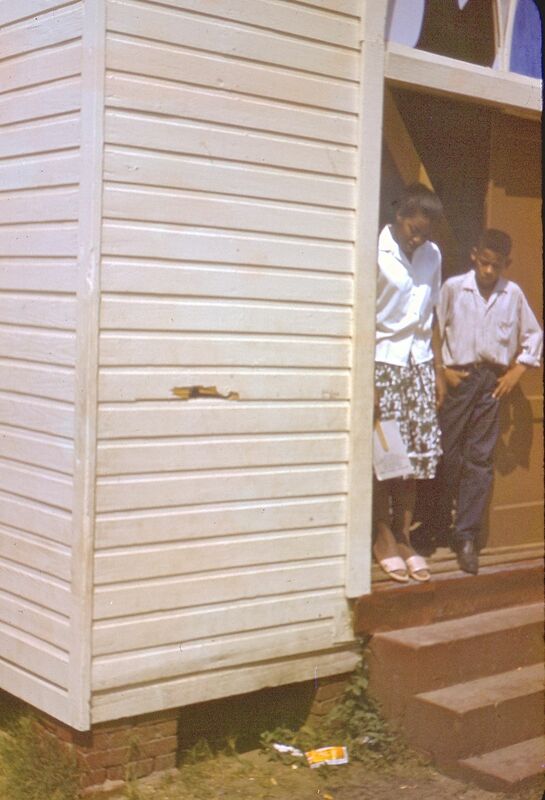 Local youth (Roosevelt Washington right) examine one of the shotgun blasts the morning after an attack on civil rights activists who had been sleeping inside the SCLC-SCOPE office. Antioch Baptist Church, Camden AL July 1965. J. Worcester photo. While much more about this story, in the words of survivors and witnesses, is in my book, “This Bright Light of Ours: Stories from the Voting Rights Fight” www.thisbrightlightofours.com, Roosevelt Wilson one of the two local youth activists standing in the doorway next to the shotgun blast the next morning. Please leave a comment if you can identify the young lady. We were all in shock at the brutal attack on our Baptist Church sanctuary and office that left one of our SClC co-workers in the hospital for months. Photo by John Worcester who worked with SCLC SCOPE in 1965. Please post replies here in comment box. Thank you!